Tuscan wines are varied and intense. This is your introduction to some of the greatest wines in the world today. the Chianti Classico, the defined area that begins just South of Florence and reaches all the way to the North of Siena. This region has in recent years upgraded in quality and the area has also got a name for the notorious Super Tuscan wines. For Chianti to have the rooster on the bottle, and be classified as Chianti, the following rules have to be met. In addition to Sangiovese, which has to be 75  to 80%, producers may use other native red grapes, like Canaiolo and Colorino, or "international" varieties, such as Cabernet Sauvignon and Merlot, with a maximum ratio of 20% and a Miniumum alcohol level of 12° for the regular and 12.5° for the Riserva. Trebbiano and Malvasia, both white grapes, can no longer be used, beginning with the 2006 vintage. The vineyards may only begin production four years after planting and only yield 3.34 tons an acre, roughly 559 gallons of wine and each vine limited to 6.6 pounds, being released only after October 1st of the year following the harvest. For the Riserva type, minimum maturation of 24 months, including at least three months of bottle aging, is required. The characteristics of Chianti Classicos are bright red ruby tending to garnet with age, with aromas of violets, with a slightly tannic finish. The terrain and climate are large factors in the development of Tuscan wines and the characteristics of the soil in which it grows. Sandstone is responsible for the wine's flowery bouquet, calcareous soils produce scents of wild berries and volcanic soils yield fresh odors of tobacco, and violets Tuscany is the largest region, producing quality wines, of Italy. are pronounced regardless of where it is grown. Modern day Chianti area has been divided into 8 sub-areas - the regular Chianti wine can however be produced in all of these areas. To distinguish one Chianti from another, a wine maker may choose to make a Chianti typical to the district that the winery is located in, thus using the appellation of one of the sub-areas with the result that the wine will be better identified by the wine buyer. The best known of all of the Chiantis, the Chianti Classico, is really no longer considered a sub-area of the Chianti (it is however mentioned on this page for the purpose of comparison). This is with no doubt the most prestigious wine region and superb appellation that we have in Italy, noteworthy for it's deep and complex red wines that are worth aging for decades. The region of the famous Brunello di Montalcino is in the South of Tuscany, so not as easy to reach, but it is by all means very much worth the longer ride. Produced in the Province of Siena (The communal territory of Montalcino), Brunello di Montalcino ( translated to the little brown one from the brown hue of its skin) made with 100% Sangiovese Grosso was known just as Brunello by the Montalcino locals in the 19th century. The wine is aged for two years in wood, and four months in the bottle with production per vine limited to roughly 4 to 5 pounds. Brunello has a intense ruby red color, and dry, warm, a bit tannic, robust finish. Food combinations with Brunello di Montalcino The elegance and harmonic body of the wine pairs well with many complex and complicated dishes such as red meat, game also accompanied by mushrooms or truffles, in addition, is excellent with cheeses. Located in Southern Tuscany and surrounds the adorable town of Montepulciano in the province of Sienna (the communal territory of Montepulciano). The "noble wine from Montepulciano" historic origins made it one of the first wines of Tuscany for trade. Vino Nobile di Montepulcianos grape varieties are at least 70% Sangiovese (known as Prugnolo Gentile in Montepulciano, and a maximum of 20% Canaiolo Nero may be included with minimum 2 or 1 ½ years in oak casks and 6 months in other vats, or 1 year in oak casks and 6 months in other vats and 6 months in bottle. Having a ruby red color, intense perfume, earthy characteristics, with hints of oak. This is not one of the most famous wines that is made in Tuscany, but it is the most stunning in my opinion. Vernaccia is supposed to mean "native" and shares its name with other Vernaccias in Italy (Oristano, Le Marche and Sardegna) that however are completely different. 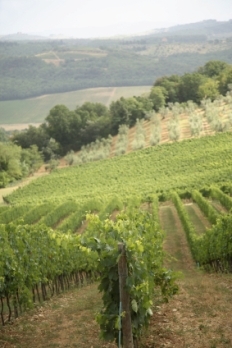 In fact, the Vernaccia di San Gimignano is a grape strictly connected to the area and cannot be found in any other wine region. Internationally, it is probably the least appreciated Tuscan wine, firstly because it is not a red wine and secondly because this indigenous grape is quite acidy, a little bitter and not particularly fragrant as for example the widely known Chardonnays. It takes a little getting used to, and since the white wine market is dominated by fresh whites from the cooler regions, it has been difficult for the Vernaccia to show its worth. Lately some Riservas have shown a great result also for aging. Grape varieties: Vernaccia (non aromatic grape) min 90%. Max 10% of non-aromatic authorized white grape varieties. Characteristics of a pale straw color, tending to golden with age; fruity and floral with a bitter aftertaste are typical in most Vernaccia di San Gimignano wines. It is also the smallest in size covering only 100 hectares of land for vines - and with only 20 wine producing farms and the allowed grape varieties Sangiovese min 50%, Canaiolo Nero max 20%, either/or Cabernet Sauvignon and Cabernet Franc from 10 - 20%, max 10% Trebbiano and/or Malvasia Bianca and finally a max 10% of other authorized red grape varieties with a minimum of 12 months in oak barrels. Carmignano has a bright ruby red color with violet nose, and soft and velvety finish.